Unit Linked Insurance Plans are an investment instrument that offer both- returns on investment as well as life cover. Investment in this scheme acts as a dual purpose plan for investors; however choosing the right place to invest your money is important. Reliance Nippon Life Insurance Company owned by Reliance capital has come up in life insurance industry with 49% stake owned by Japan’s Nippon Life Insurance and is growing at a great pace and offers you a wide range of funds. This is one of the most sorted Reliance schemes. Available with ultimate flexibility, there are five funds options for investors, out of which 2 are equity-oriented funds, 1 is a balanced fund and 2 are debt-oriented funds. This plan has numerous features and benefits that makes for optimum utilization of your money. Entry age in this plan is fixed between 7 to 60 years. One payment is applicable for Single Pay plans and for Regular Pay plans, as long as the policy is active. Minimum top-up premium in Reliance Classic Plan II is Rs.5,000. Minimum Premium under this plan is Rs. 75,000 for Single Pay plans, Rs. 30,000 for Regular Pay plans in 6-month or monthly modes, and Rs. 20,000 for Regular Pay plans in yearly payment mode. Minimum sum assured is at least 7 the annualized premiums for entry age higher than or equal to 45 years and 10 times the Annualized Premium for entry age less than 45 years. Premium payment frequency can be monthly, quarterly, half-yearly or yearly. Death benefits: In case of the unfortunate event of death of the insured person occurs, the higher of the applicable sum assured or fund value will be paid to the nominee. Despite this, top-up sum assured or top-up fund value, whichever is higher, will also be paid to the beneficiary. Maturity benefits: The Reliance Classic Plan II comes with the maturity benefit which is equal to the fund value. The maturity benefit can also availed through the settlement option over a period of 5 years. Flexibility: Investor can avail any of the five unit-linked funds offered by Reliance Life and can enjoy the flexibility of switching between funds as per your choice and requirement. Tax benefits: Tax benefits are applicable under Section 80C, 80D and 10(10D) of the Income Tax Act, 1961. These are subject to change as per the prevalent tax laws at the time of premium deduction and claim settlement. Reliance Nippon Life Premier Wealth Insurance Plan can be tailored to individual needs and to keep up with the changing priorities over time. The plan allows you the flexibility to balance the protection and investment needs during its tenure, in an active or a systematic manner. Choice of investment options - Select an investment option of your choice from. Death Benefit In unfortunate event of death of the Life Assured, the nominee will receive the maximum of Base Sum Assured or the Base Fund Value or 105% of the premiums paid. In addition, the maximum of all Top-up Sum Assured or Top-up Fund Value or 105% of the all total Top-up premiums paid. Maturity Benefit On survival of the Life Assured till the end of the Policy Term, total Fund Value which is the sum of Base Fund Value and Top-up Fund Value, will be paid. Wealth Boosters Wealth Boosters in the form of additional units will be added starting from the end of the 8th Policy Year. Each Wealth Booster will be a percentage of the average of daily Fund Value in preceding 12 months of the Base Plan in the same Policy Year and will be 0.30% per annum for Regular/Limited pay and 0.50% per annum for Single Pay. Why Choose Reliance ULIP plans? Tax benefits: You can avail for tax exemptions on premium payments as well as death benefits as per the Sections 80C and 10(10D) of the Income tax act, 1961. Simple process: Investing in Reliance ULIP plans is easy and convenient and the option of applying online is also available. With it’s not so complicated and flexible features, it is the right choice to make your investment. Easy fund management: If you are not well-versed in market movements, you can leave the fund management to Reliance Nippon experts. You can even manage your funds on your own and make decisions such as which funds to invest in and whether to switch funds or not. Easy claims: Reliance Nippon guarantees you to get claims approval within 2 weeks, the process will happen only after proper documentation and verification. The ratio of Reliance Nippon’s Claim Settlement is 95.01% as of March 2016. Proof of Identity: Your passport, Voter Id, Driving License or Aadhaar card may act as a proof of your identity. Any utility bill not older than two months of any service provider. Bank account or Post office saving account statement. Letter of allotment or accommodation from the employer. A letter issued by foreign embassy or Mission in India. The frequency of premium payments can be modified after submitting duly filled in and signed request form to the customer service team of the insurance company. If the plan provides an option for changing the premiums, the customer service team will act on your request. Reliance Nippon offers four modes of payment: Online mode by logging in through your client ID and Password. Pay at Suvidha Centre via cash or cheque. Register yourself on the site and click on the pay Reliance Life insurance option. Electronic Clearance System for paying a premium of renewed policies. How can I check policy status for Reliance Life ULIP Plans? Register yourself on the e-portal and after generating password login to your account. Click on the policy status tab to get all the details of your Reliance ULIP plans. What is the policy renewal process for Reliance Life ULIP Plans? Renewal of your policy can be done through the following modes: Online mode: Login to your account and click on the required renewal tab and make payment via cheque cash or net banking. Electronic Clearance System: Fill in the desired form and submit all the required documents. What is the company’s process to settle claim for Reliance Life ULIP Plans? Reliance Nippon guarantees 12-day claim settlement. Submit all the documents in your nearest branch along with claim form in your city and after verification, the cheque will be dispatched in next 3 working days to your address. What is the policy cancellation process for Reliance Life ULIP Plans? Submit a duly filed cancellation form along with relevant documents at any branch and after verification, the policy will be deemed to be cancelled. 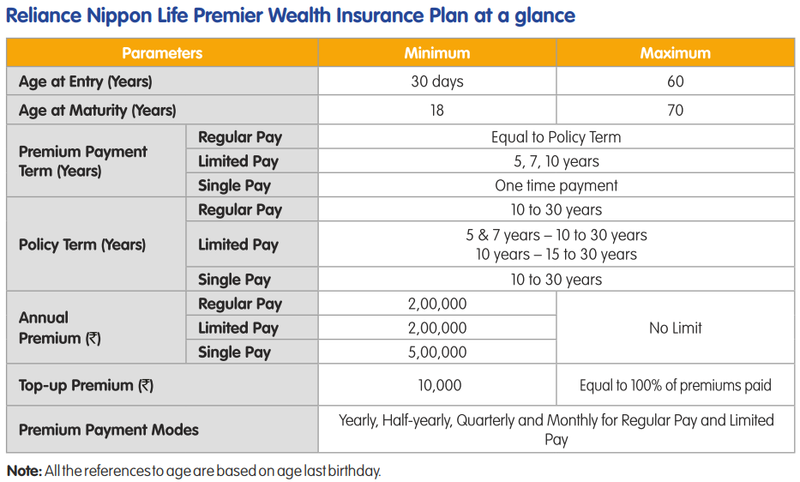 How does Reliance Nippon Life Classic Plan II works? Scenario 1: He pays Regular Premiums and remains invested in the debt oriented fund till maturity of the policy and gets steady returns on his investment. Scenario 2: After 3 years, Mahesh feels that equity market has stabilized and is poised to provide superior returns in the long term. He switches his investment to Life Equity Fund 3 (Equity oriented fund with higher risk compensated with higher potential returns). Further, he opts for premium redirection to ensure that his future premiums are also invested in the equity oriented fund. Over time, his investment appreciates significantly and he enjoys superior returns on his investment. Scenario 3: At the end of the 6th policy year, Mahesh decides to purchase a new car by utilising his investments in this plan. He makes a partial withdrawal of 20% of his Fund Value. Scenario 4: At the end of the 10th policy year, his father is hospitalized with a Critical Illness and he is in urgent need of funds. Instead of taking a personal loan, he surrenders his policy and receives the complete Fund Value available as on the date of surrender. Scenario 5: In the 3rd policy year, Mahesh dies in an unfortunate accident. His wife, who is his nominee, receives the Death Benefit which is highest of the Base Sum Assured or Base Fund Value or 105% of the premiums paid, plus an additional amount equal to Sum Assured as an accidental death benefit, as shown below. Here, the Base Sum Assured is higher than the Base Fun Value and 105% of the premiums paid.